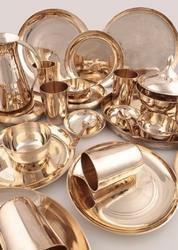 We offer a wide range of Bronze Dinner Set to our valuable customers. 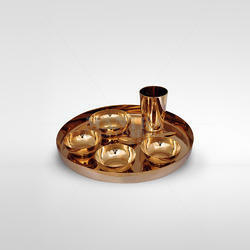 These Bronze Dinner Set is provided by us at very reasonable price. Dinner Set contains :1 Dinner Thali2 Dinner Vati! Pudding Plate1 Baby Spoon1 Glass. Our company has been successful in winning appreciation from the clients as one of the most prominent names in the trading of Bronze Dinner Set. Our reputed entity is engaged in supplying Bronze Dinner Set. We are manufacturer of Bronze(Kansa) Dinner Set and kitchenware. We are a leading manufacturers of kansa utensil in India and we uses 100% pour item. No 1 Quality in India. We provide to you our client laboratory report. This Handmade Product.This is called kansa. It is made by Copper and Tin. Kansa does have metal poison for this reason kansa plate and utensil is suitable for health. Kansa is traditional art of Bankura. Its finishing quality and out looks is good.